I wasn't planning on participating in #flappyjam, since the purpose of the jam itself doesn't really make sense. But then I had an idea, and this game popped out 24 hours later, which is a huge surprise for this slowpoke. Let me know if you have any questions or feedback. Thanks. I thought this was a pretty cool take on things. It even manages to feel like a non-flappy-bird-inspired game sans the bird sprites. Ya, my Tiny-Wings-esque bird sprites are only because the #flappyjam "rules" say to take inspiration from a classic game. It's also the reason why the game didn't take that long to build, as I usually spend a ton of time trying for more original art. If I refine the game, I may go for more original sprites. Also, creating a game with little round birds (ala Angry Birds, Tiny Wings, etc.) was the last thing I ever thought I'd be doing. I love it except the that I don't like to die from my own projectiles. If you took away the projectiles hitting the player then it would just be a game where some enemies very slowly creep from the left side of the screen, occasionally and randomly being set back. It would also remove a significant amount of tension and drag on sessions to the point where trying again sounds like an off-putting time investment. I have the same response other people have. My exact words to friend when opening this game. "I'm glad its pushing people to develop, but everyone in their mother is making a flappy birds clone." When I actually opened your game I was surprised. I like the different take on it. I could not get past a few seconds though. Is there a strategy to the game, or is it more random whether you die or not with all those fireballs coming at you? Also could you play may game too, thanks? View and like my page if it appeals to you. Thanks! Your death to the fireballs isn't random. You can control the amount of fireballs on the screen and dodge them. I feel out of control of where my fireballs go though, which is irritating. I just have to shoot a bunch of them and hope the approaching birds get hit. Though, it's kinda cool how the best way to kill the birds is to fire a bunch, which in turn makes the game more difficult since you have a bunch of projectiles to dodge. This is a neat concept. Thanks all for the feedback. I've updated the game so that the angle of "firing" isn't as steep. It's still difficult enough, but with less random fireballs blindsiding you. Let me know. Sorry for the double-post, but I've updated Lava Bird with different "levels" of enemies to give an indication of progress and maybe some replay motivation. I'd love feedback on whether you think it works or not. Wow. Another nice one by Unept. Its got a strange sense of tactics to it such as "picking your spots". It kind of makes me feel like I need to be more willing to experiment with the simple ideas. And I definitely see the Tiny Wings bird shape in there. That game is probably my favorite iOS game ever, by the way. Flappy Bird is inspiring unborn children to develop video games? WUT? This game is really neat!!! 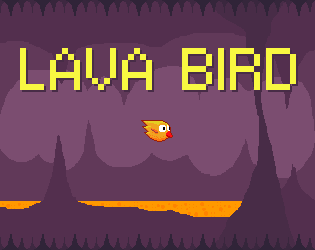 So Lava Bird is proving quite popular, and I may put it on mobile devices. However, while I feel the gameplay is unique enough to not be considered "a clone," the Tiny Wings-esque birds in it are ridiculously clone-y. If not a lava bird, then what? I may just keep the Lava Bird but redesign it a bit. As far as enemies go, I'd like to have a different enemy type at each level. That way, the silhouettes at the top would all look different, adding intrigue and repeated gameplay. - A cave tribe that is upset about Lava Bird drinking the magic lava elixir, causing the whole lava-spitting problem. I'm talking graphics only; gameplay will remain the same, each enemy level is slightly faster than the previous level. Honestly, I wouldn't go for a ridiculous backstory; the minimalism is great and I think the self-explanatory quirkiness of the game should remain. Have lava penguins attack him. Or lava chickens. Or lava turkeys. Or lava ducks. OR LAVA TURDUCKEN! Yeah. However, I do kind of wonder whether or not it would fare well on mobile, particularly phones. Screen real-estate is limited with all that stuff flying around (particularly the swarm o' fireballs) on smaller devices, and I wonder whether you could maintain the same precise control whilst trying to rapid-tap your screen. Might be worth a shot though. Very cool take on the game. You should definitely get this published on mobile asap.